I’ve been taking a few minutes at the end of the day to write down one “transcendent” moment I had. Like how it felt to go out of my way for someone, or how the pouring rain wasn’t so awful when I looked at it falling in a street light. Writing down one good thing each day that goes beyond the obvious. I hope that filling up a notebook with these wonderful feelings and reflections will, in turn, bring a deeper sense of spirituality and admiration for the world that my life has been missing. I think that food could be almost every entry in my notebook. Food has changed my life. It has brought me new skills, appreciation for nature and nutrition, and helped bring me closer to my friends and family. I love the creativity of a recipe where an ingredient is stuffed with another version of itself. Like stuffed zucchini and these mushrooms. 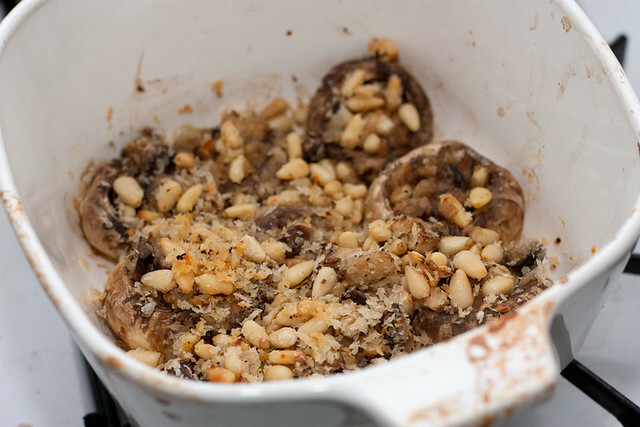 The caps are filled with a sauteed mixture of the stems and garlic, bread crumbs, and pine nuts, taking the mushroom to a whole different level and then bringing it right back to its origins. Does that make sense? I normally don’t make side dishes for my meals. I make the main course, and that’s all. I usually have a decent amount of vegetables in my main dish already, but I’m trying to incorporate more creative ideas on the side. It’s nice to be able to eat a little bit of one dish, and then nibble on another. For this meal, I paired the mushrooms roasted with pine nuts alongside a polenta gnocchi with roasted red pepper sauce. The two dishes complimented each other, and the winter season, wonderfully. 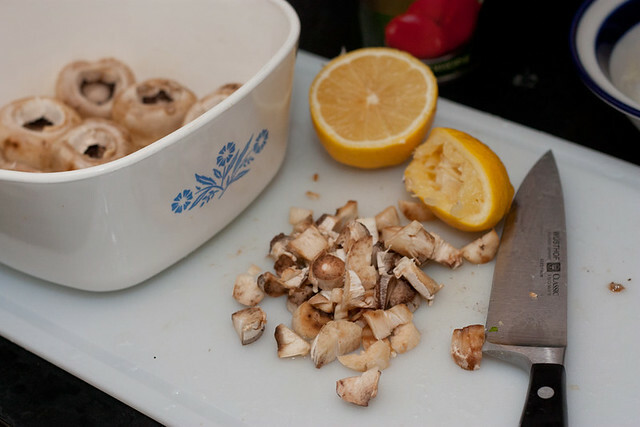 Plus, the mushrooms can be cooked with the polenta gnocchi and come out of the oven right at the same time! It’s like they’re meant to be together.